This is another one of my Mock Swapp Flowers. But I had a thought that coloring it on the back side with my Copic Markers would be cool. It wasn't as "cool" as I envisioned, but it worked. And it dried super fast which was really the most pleasing part. 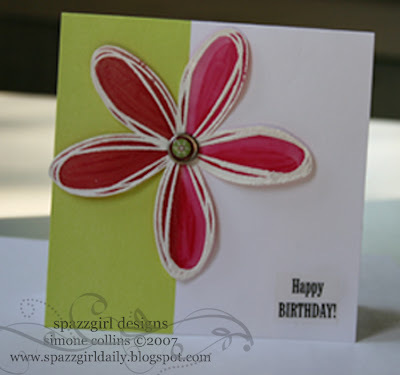 This petal stamp is from Pick A Petal Stampin' Up set. The brad is from Target's dollar spot, if you haven't been to Target lately, you've been missing all the goodies. Card is from A muse. Greeting is an old sticker, not sure of the brand. I'm totally scraplifting this idea from you, you know! Good job. Oh WOW! This is such an awesome idea. I'll have to try this out sometime.